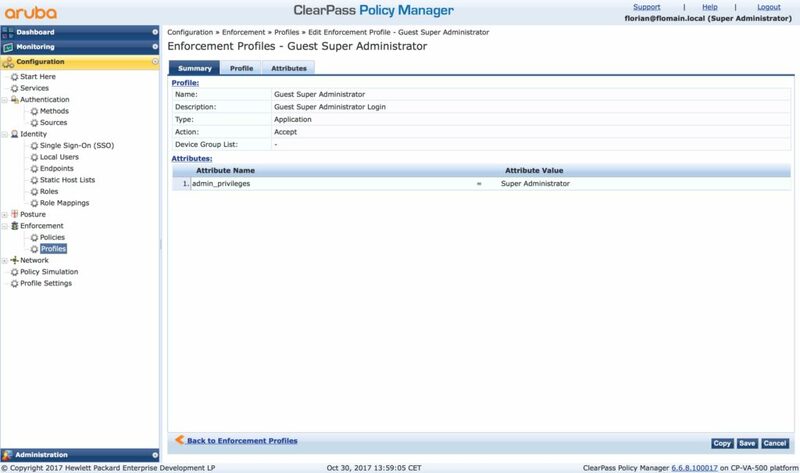 ClearPass Guest is one of the most used guest systems and makes it very easy to allow specific people or a group of people to create guest accounts. They can also maintain their own accounts. To allow this you need to configure the ClearPass Guest operator login. 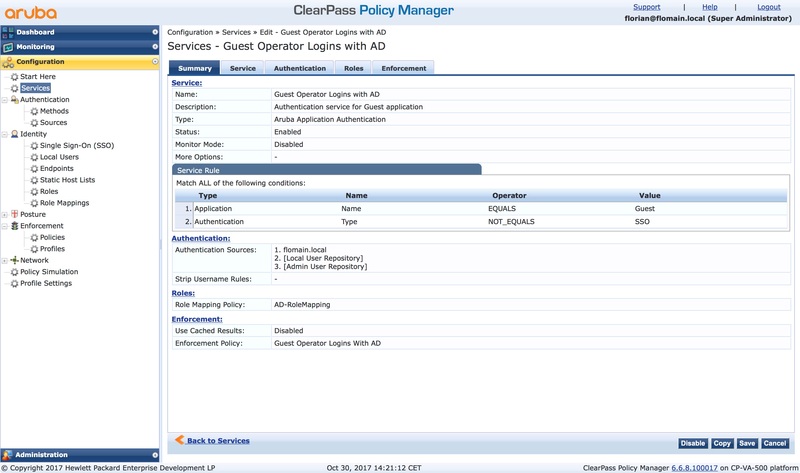 The last post about operator login for ClearPass covered the login for the radius server part. This time it’s all about the guest part of ClearPass. And in contrast to the last post, this is more complex. The main reason for this is, that you will allow more people to access the system. They also have different objectives, but I will explain this later on. The first step to get this done is to create different operator profiles for different user groups. This is the hard thinking part of this setup. In my lab, I have two different profiles. The Super Administrator has all the power to do everything. But not all people in the organization can resist such a big power, so I give them only to the network admins. All other people get the BYOD Operator profile. This profile allows them to manage devices they onboard. This assumes you allow device onboarding for people within your organization. You can also allow your users to create and manage guest accounts. Simply add another profile or modify an existing one. You can do everything if have the Super Administrator power, what you want. The process stays the same as in the following paragraphs. Have a look at the existing ones and use them as possible. Or create a new one. I use the existing ones, “Super Administrator” and “BYOD Operator”. The name has to be unique. Also, create a meaningful description and do this for all ClearPass Guest operator profiles you use. Rule 6 and 7 are new. So every user in Active Directory, which is a member of the group “Guest-Super-Admin” get the “Super Administrator” role. I evaluate all rules, so a user can have multiple roles. keep this in mind. This is important for the policy, later on. The above is a “Generic Application Profile”. The interesting part is the attribute part. 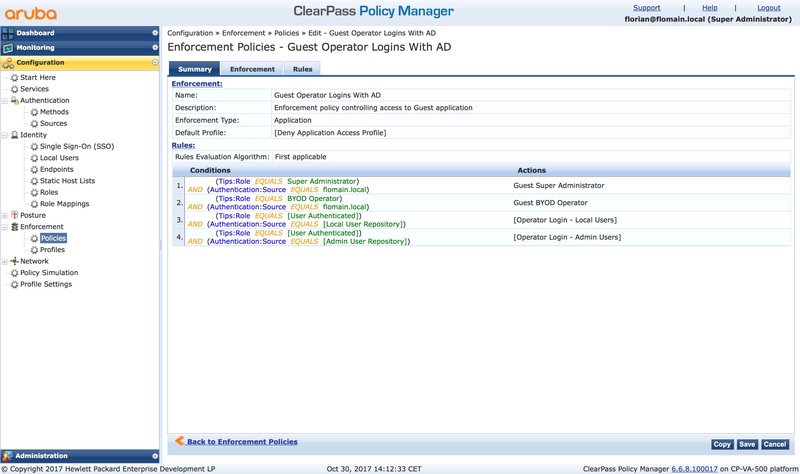 The “Attribute Name” should be “admin_privileges” and the “Attribute Value” the name of the ClearPass Guest operator profile name. 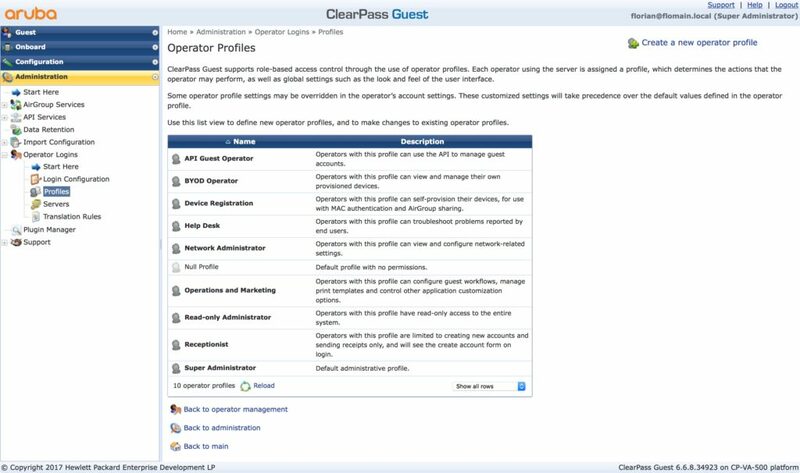 Do this for all ClearPass Guest operator profiles you have. Use a meaningful name and add conditions for all the enforcement profiles you have created before. I have also moved them up to the top. I include the existing conditions as well. This makes sure, you can log in with the internal admin account. You need to add as many conditions as enforcement profiles you have. 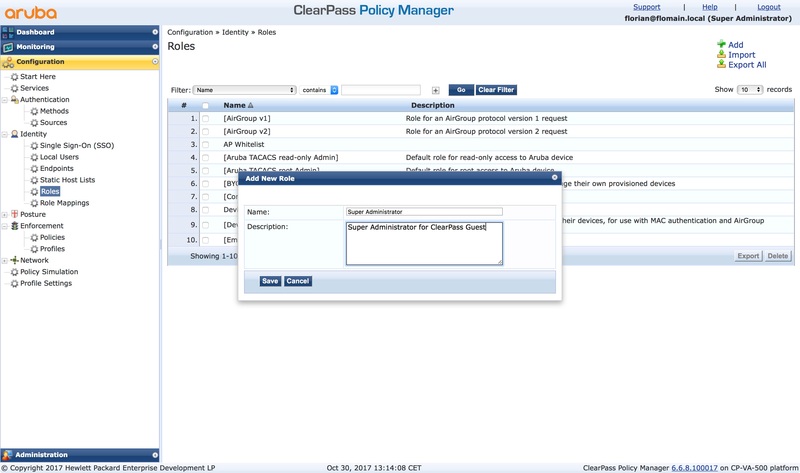 As the policy use the first match condition, start with the ClearPass Guest operator profile, with the most privileges and go down to the one with the least privileges. I use my AD as an additional “Authentication Source”. 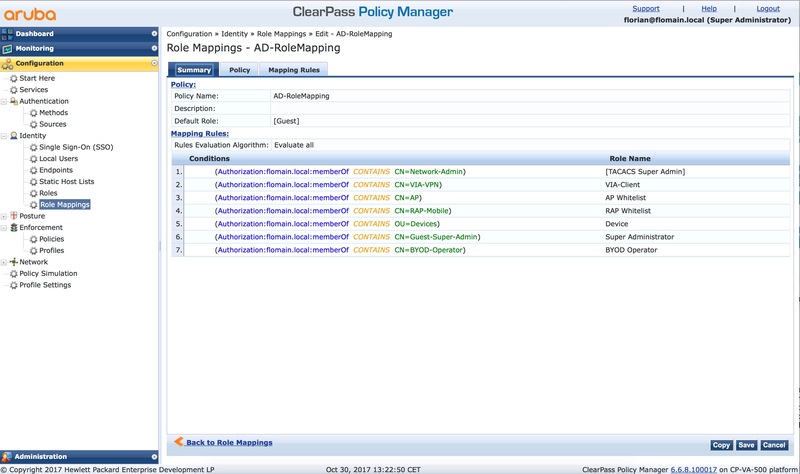 I also use the “Role Mapping” from before and the “Enforcement Policy”. Altogether makes a new service. Now, you need to move the new service before the old one in the list with the “Reorder” button. I put it in position 2. You can now check if it is working. Logout from ClearPass and login to ClearPass Guest with the AD credentials. The final step is to disable the old default service. Just click the green sign at the end of the row of the list of services. It turns red. Now the old service is disabled. Test if the build in account still works. Just to be prepared for the moment when the AD guy kills the AD.